Clean Water Action members and staff mobilized quickly during lame duck. We organized lobby days, made thousands of phone calls, wrote letters to representatives, rallied – all in the hopes of stopping the worst of these bills from being passed. In the end, we were successful in stopping several of the bad bills, including an attempt to strip the power of Michigan’s Attorney General, and a bill to allow more dark money into our elections. Sadly, the worst bills for our environment all passed and were signed into law by now former Governor Snyder, cementing his legacy as the worst Governor for our Great Lakes and environment in Michigan’s history. Clean Water Action released a scorecard for the final four weeks of the 99th legislative session. Our scorecard tracked several of the worst bills relating to the environment and democracy. With so much moving so quickly, our scorecard could not include every single bill we were watching, but we did include the worst of the worst. Notable omissions include HB 6595, will make it much more difficult for citizens to get initiatives placed on the ballot, and SB 1195, which will allow more radioactive waste to be stored in Michigan landfills. Amidst the fury of lame duck, several Michigan lawmakers rose to the challenge and stood up for our environment and democracy. They are included on our heroes list below. Several others took disappointing votes. They are included on our zeros list below. Christine Greig: The incoming House Minority Leader did an admirable job in both holding her caucus together and working to get amendments added to some of the worst lame duck bills. Further, her questioning in House Government Operations Committee on the Line 5 bill, and the bill to strip power from the Attorney General was thoughtful, pointed, and revealed the corrupt process that allowed these bills to move forward. Representative Greig received 100% scores in both our Environment and Democracy sections. 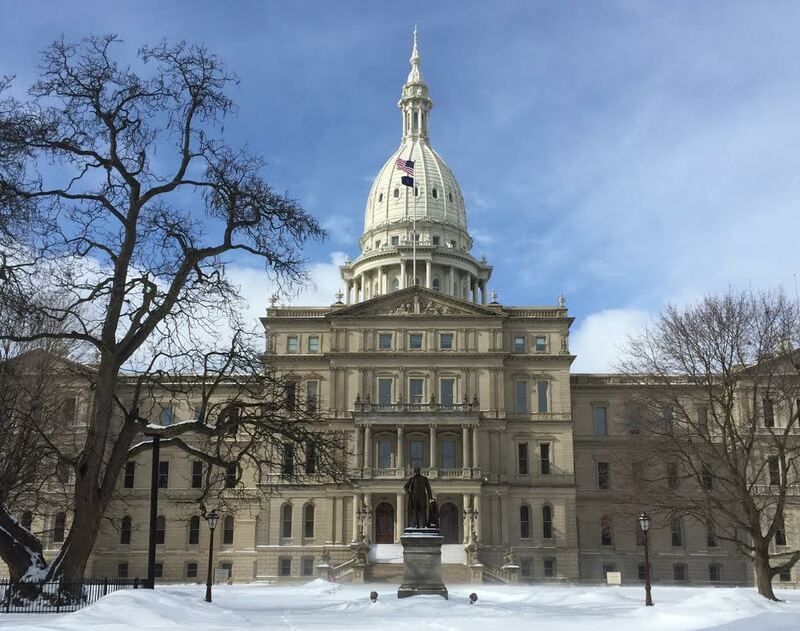 Sarah Anthony: Lame duck 2018 was a legislative baptism by fire for Representative Anthony, who was elected in November to serve a partial term as replacement for Andy Schor, who vacated that seat to run for Mayor of Lansing. Her first days as a state legislator were during lame duck. Representative Anthony did an outstanding job of advocating for our Great Lakes and our Democracy, achieving 100% scores in both categories. Erika Geiss: Representative Geiss (now Senator Geiss) got to the heart of the issue at hand, both in the questions she asked and points she offered during discussion of the wetlands and toxic cleanups bills in the MI Competitiveness Committee. Her impassioned floor speech opposing the dark money bill showed us that she is truly an advocate for the people. She also earned 100% in both the Environment and Democracy sections of our scorecard. Abdullah Hammoud: Representative Hammoud worked across the aisle all term in an effort to pass a strong statewide sanitary code to regulate septic systems. Despite his best efforts, the elements of the proposed sanitary code that would have protected our environment were stripped out of the bills by the time they were passed out of the House Local Government Co mmittee. Representative Hammoud had the courage and political integrity to remove his bill from the package, and advocate for his caucus to oppose the weak and ineffectual version of the sanitary code bill. His leadership on this helped ensure that the sanitary code didn’t have the votes to pass. Representative Hammoud earned 100% in both categories. Jim Ananich: The Senate Minority Leader kept fighting for his constituents throughout lame duck. Thanks to his efforts, there was only one Democratic defection in the Senate on any of the bills tracked for our scorecard in either category. Senator Ananich not only earned 100% score in both categories, but was able to ensure that all but one of his Democratic colleagues in the Senate did the same. Sue Allor: Rep. Allor was the only member of the Republican caucus in either the House or Senate to achieve a 100% lame duck environmental voting record. It took tremendous political courage for her to buck her caucus, and stand up for her constituents. Representative Allor represents Oscoda, which has been facing PFAS contamination for years. Her district would also be one of the first affected by a Line 5 failure. Tory Rocca: Senator Rocca was the only Republican in either chamber to achieve 100% in our Democracy section. As this was his last term in the Senate, Senator Rocca could have easily justified going along with his caucus, but instead he voted to protect our democracy and the rights of his constituents. He earned 100% in our Democracy section and 75% in our Environmental section. Tom Casperson: Tom Casperson has made a legislative career out of attacking our environment and weakening our democracy. This lame duck session was no different. He sponsored the Wetlands Destruction Act and the Line 5 tunnel bill, earning himself a 0% environmental score. Senator Casperson defended himself in Bridge magazine saying “I’m not some dastardly guy who wants to destroy the environment.” His role in lame duck 2018 is the exact reason why we should do away with lame duck sessions altogether– unaccountable lawmakers who will never face the voters again do the bidding of corporate lobbyists with no regard for how it will affect their constituents or the future of our state. Peter MacGregor: In the fall of 2017, No Stricter Than Federal sailed through Senator MacGregor’s committee. Shortly after the committee vote, and after hearing from constituents facing PFAS contaminated wells, Senator MacGregor asked that the bill be paused due to the detrimental affect it would have on the state’s ability to regulate PFAS and other emerging contaminants. As soon as he won re-election, No Stricter Than Federal was back on the Senate agenda, and he voted in favor of it. He voted to pass this bill knowing the detrimental affect it will have on his constituents in Northern Kent County, many of whom can’t currently drink the water coming from their taps. Senator MacGregor earned a 0% score in both categories. Lee Chatfield: Representative Chatfield is the current Speaker of the House. During lame duck, most of the bills we were tracking went through committees that were chaired by Rep. Chatfield (Government Operations Committee and MI Competitiveness Committee.) Not only did he earn a 0% voting record in both categories, but he severely limited testimony in his committees, making it difficult for the public to voice their concerns. Adam Hollier: In his first consequential vote on an environmental issue, Senator Hollier was the only Senate Democrat to vote in favor of legislation to clear the way for Enbridge Energy to build an oil tunnel through the Straits of Mackinac. This hastily written and poorly thought out legislation also sought to tie the hands of Governor Whitmer and Attorney General Nessel. Although he voted with his caucus on the other bills we tracked, there was no excuse for voting in favor of a bill that could bring such monumental harm to our Great Lakes. Senator Hollier was the only Senator in his party to not earn 100% in our environmental section. Phil Phelps and Brian Elder: Representatives Phelps and Elder both earned only a 50% environmental voting record. With that, they tied for the lowest environmental score for Democrats in either chamber. Both of them voted in favor of the Line 5 bill and the Wetlands Destruction Act. The value of our wetlands in the Great Lakes region can’t be overstated. Wetlands protect our lakes, rivers, streams, and groundwater by filtering out harmful pollutants before those pollutants make their way into our surface and ground water.